TUFF flyfishing.co.uk headed North Westwards to explore a great river in a hidden gem of a glen; West of Inverness lies a glen that most drive past on there way up Strathglass heading for Glen Affric, blink and you would miss the turning for the wee single track road that leads you westward up a glen that is in my biased opinion the far more beautiful sibling of the famous Affric. ​Much like the secret garden a gate greets all, keeping the wonders beyond hidden, vehicle access restricted on the private road to certain times and months which thankfully limits the car numbers and the obligatory coach tours that haunt so many glens like Affric. 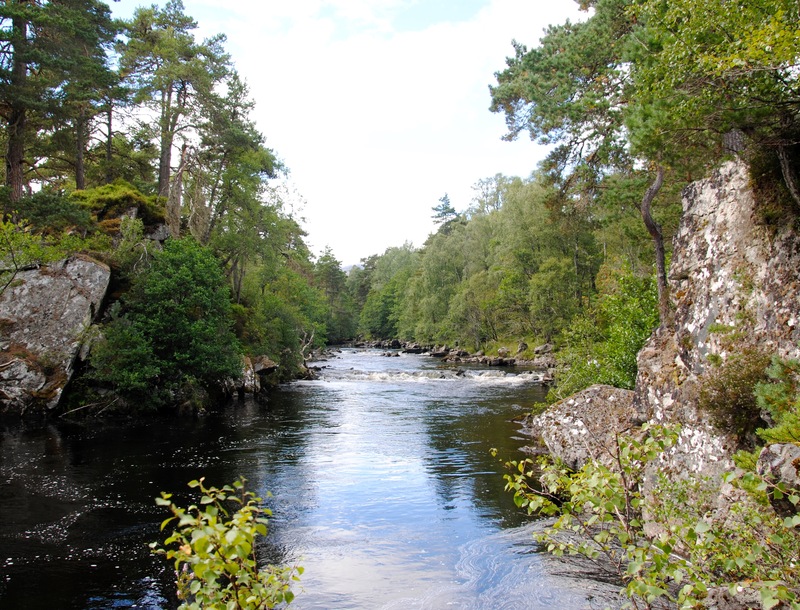 This secret highland glen is Glen Strathfarrar a glen they named twice it was so good. Strathfarrar reaches westwards for over 30 miles almost touching the west coast its ramparts wild rugged Munros senetery like along its flanks and headwalls separating it from its neighbouring Straths and hiding this wild beautiful gem of a glen. However the 1950s saw its walls breached as Hydro electric brought dams and turbines across the highland, Strathfarrar was tamed somewhat as the waters of the River Farrar, Loch Monar and Beanachrain were held back and harvested to drive these turbines. Though the Glen has had its circulatory system tapped its wild heart still beats strongly and this hidden gem feels as wild as it ever was, with its changing character that develops as you climb westwards from the rivers junction with the River Glass; Birch, Alder and Scots pine trees fill the lower glen a remnant of the ancient Wood of Caledonia, providing a magical wooded landscape that fills the lower 5 miles of the Strath hugging the River Farrar and on summers day makes me feels like I could happily stop time and loose myself here in my own personal middle earth. Winding westwards following the river upstream through its slabby gorges and tumbling riffles you emerge through a narrow road cutting above Beanacherain Dam where this glacially hewn glen opens before you; to loch, steep slopes of heather and glistening rocky outcrops of mica rich schist (sorry the former geologist in me getting over excited!) 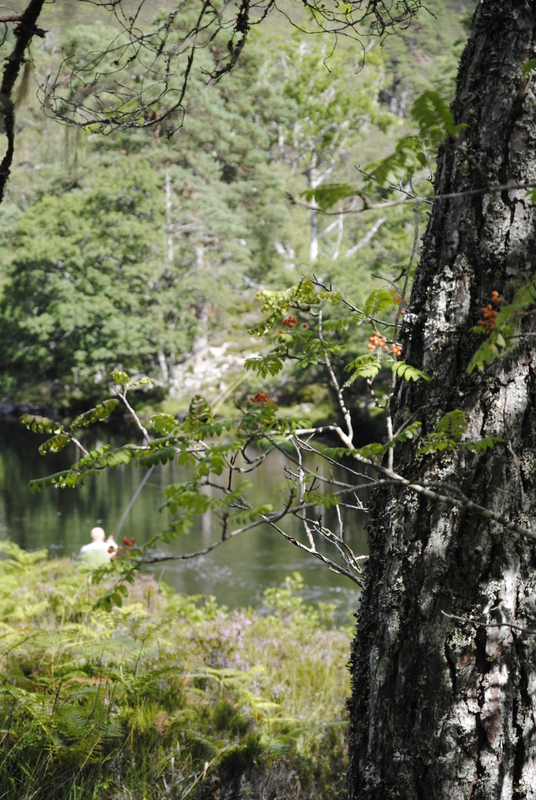 a patch work of moorland and native woodland draws you westward to Loch Monar at the head of the glen and the end of the single track road. An area depicted beautifully in a snap shot of what seems like a simpler time in the captivating book “The Isolation Shephard” written by Iain Thompson about a time before the hydro. ​If you hadn’t guessed by now I have a special attachment and love for StrathFarrar; or have I been too subtle? I was lucky enough to have been born and spent my early life growing up on the banks of Loch Beannacherain in the glen, sadly over the last 20 years I haven’t been able to return often enough. With autumn knocking on the door of summer and the end of the trout season beconing I made a journey home to fish the River Farrar! Well at least to fish the bottom 5 miles of the river below Beanacherain Dam. 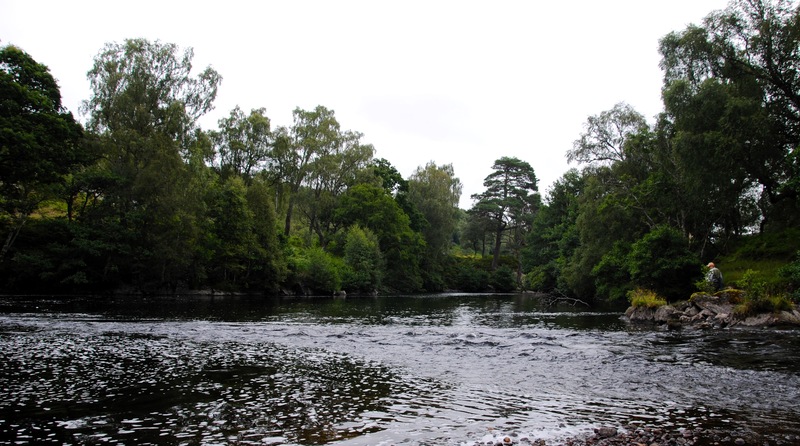 Culligran Estate has 5 miles of double bank fishing on the River Farrar extending from below Beannacharan Dam to just below the the Gate, divided into 3 beats aptly called Top, Middle and Bottom with over 30 named pools, all fly only. Almost all of them are within easy reach of the road and with the best parking spots cleverly mark by a little red numbered flag that’s really makes finding the pool very simple, so no excuse for not finding the pool or a parking place. 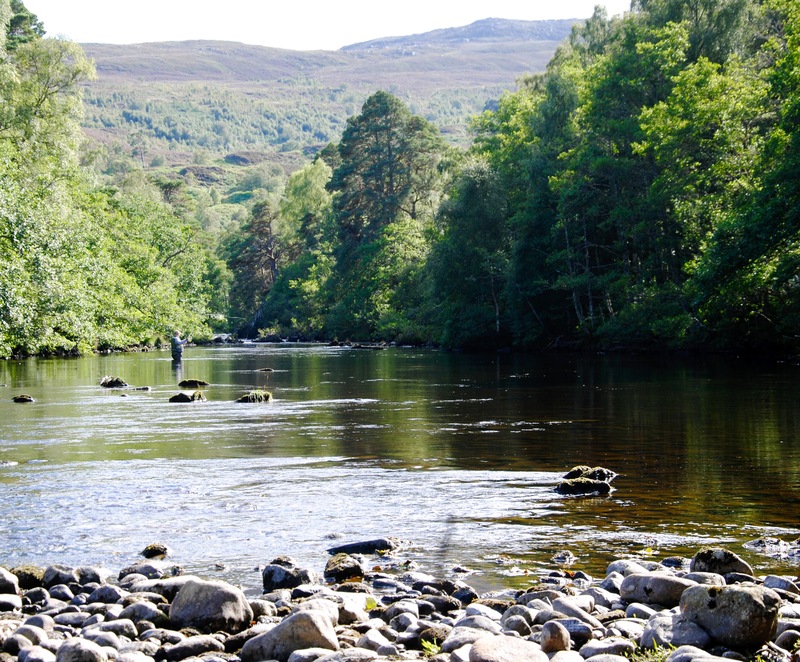 It’s popular so book in advance and I have to say It was a very warm welcome from both Frank and Juliet Spencer-Nairn the owners of the Culligran Estate who have a huge love and enthusiasm for the Glen and the quality fishing the River Farrar has to offer. 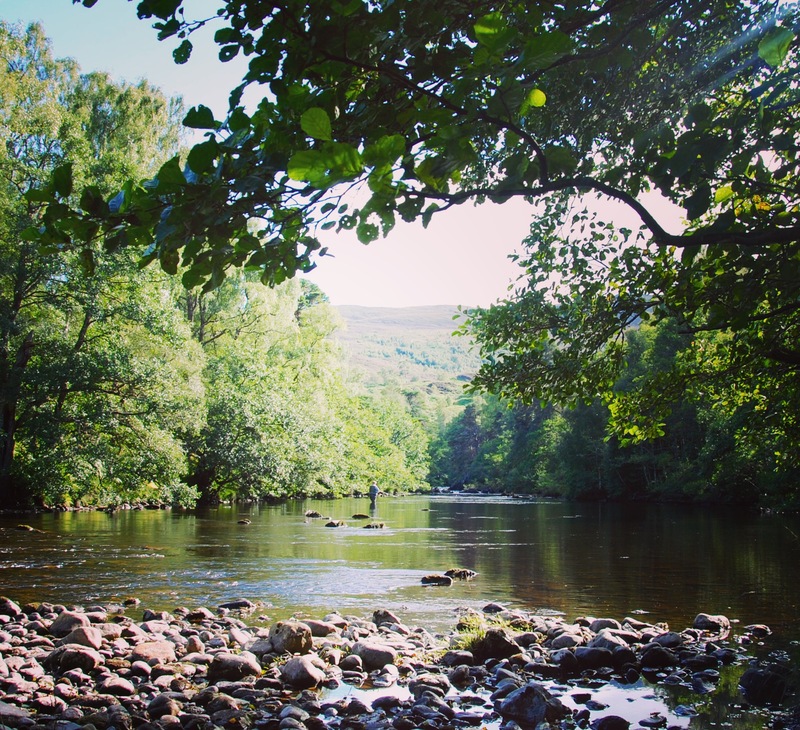 The Farrar offers both quality salmon and Brown Trout fishing with April –Mid June offering the best Brown Trout fishing with many of the bigger Trout being taken during the early season and there is plenty to explore over the 5 mile beat. Although it’s a hydro river the Farrar retains many of the quality’s of a natural spate river with one huge advantage, a weekly freshet where by the dam is opened and closed gradually over a 48 period on a Thursday, Friday to put through a flush of water; its all in the name “Freshet”. This Flush of fresh water through the system is for the salmon fisher, aimed at livening up any fish and encouraging them to run. As per usual among the fishing and science community opinions are divided about the effectiveness of “Freshets”. I think I’ll let sleeping dogs lie and leave the arguments to the salmon fisher, personally I think these runs of water are an advantage to the Trout fisher as much as the salmon fisher, any Trout bum will know having had a fruitless or frustrating day during the warmer months and the rivers are on their bones; the fish quickly feel pressured and switch off, but the “freshets” help livened them up and more willing to feed/take a fly. Anyone who has fished a highland spate river that is rising or in moderate. spate where it has risen slowly and the water is not turgid with silt can atest to some fantastic top quality sport. During this “Freshet” the rapidly rising river caught me quite unaware, I was fishing a tricky pool to position yourself to cast caught between deep water and over hanging trees, I only becoming aware that the river had risen as I came to exit the pool by the shingle I had walked on 30min earlier which was now submerged 6 inches under water. It was a Monday and a freshet wasn’t scheualed and that is where I made the school boy error! I had expected the status quo and in some circumstances that lapse could have proved deadly and reaffirmed how important it is to keep your wits about you, because it maybe a controlled river but things can and could go drastically wrong very quickly. A river can rise exceptionally quickly be it from the opening of a Dam or a flash flood induced by heavy rain fall a mile from your location. Never under estimate a river – an example of this was brilliantly illustrated by a video post by Cawdor estates this summer shot on the River Findhorn (Avalible on the Cawdor Estates Facebook page) that saw a placid river turned into a raging torrent in 3 minutes, a terrifying demonstration of natures power. I explored the river searching out pockets of shadow, normally this glorious late August is cursed by the fisher but having been savaged during the still overcast morning by a massed assault of midgies, the warmth of the late summer sun and its ability to deter these little blighters was most welcome; “blighters” was not the actual word I think my language was somewhat more colourful through gritted teeth as I furiously attempted to ignore them casting and focusing on my fishing. Evidently swearing like a trooper at them has little to no effect in stopping them or the irritation, they are in your nose, eyes, ears and they find every tiny chink in your clothing and repellent being able to drive you to distraction. I have developed quite an effective technique of being able to change my flies whilst jogging in circles because let me assure you if you stand still you will be lucky to survive becoming a buffet for a fog of Midgies! 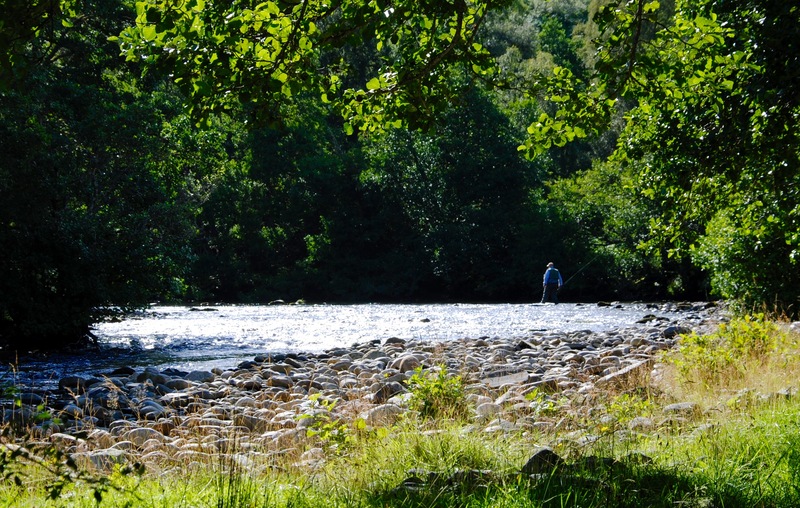 Discovering a large pool; J2Bostail above a fork in the river leading to some nice broken riffles and pocket waters that had the sought after shade and the catnip that every trout fisher craves, the occasional sound and sight of rising trout feeding on the surface. For the Farrar like any of these highland spate rivers I find size of fly is as important and sometimes more so than the actual pattern, looking to mimic naturals as closely as possible particularly for my dry fly choices so emergers, terrestrials and usually a good supply of PTNs and HRE nymphs for subsurface both weighted and unweight. Making sure to carry a good selection of sizes from 12 to 22/24 for all my flies, many fishers would also carry some Scottish Trads’ like Kate McLaren and butchers but I prefer to use North Country Spiders, I just find they fish more productively, but then that is purely a personal preference, and confidence in them producing. As I always say, a fisher that fishes a fly with confidence is more successful and fishes more effectively, that one who constantly questions their choices. The day so far had not been particularly productive having risen several trout to the fly they had failed to stick, so a change to a size 18 grey Para dun I use an awful lot when small up wing are hatching produced immediate results rising a couple of fish when fishing beneath the over growth where there was good flow of water along with the intising rings and sound of sipping trout beneth the fallen and over hanging trees. Presenting the fly up stream allowing the current to carry the fly under the over hangs and over the fish being sure the 1.8lb 2x tippet is well mudded and hidden avoid any drag, I imparted the occasional “tweak” to the fly (single point fly no dropper) and now my fortunes turned as a fierce wild StrathFarrar brownie sipped down my fly and this time with barbless hook help I had a beautiful very dark Farrar brownie of just under a pound to the net. A long wade over the next hour and a half produced 4 more reasonably sized trout and a feeling of being completely detached from the world, I could easily have been the only person alive; a feeling of total bliss. With the sun beginning to touch the hills above I made the long wade back to the road and the car with a real feeling of blissful satisfaction from a days fishing. 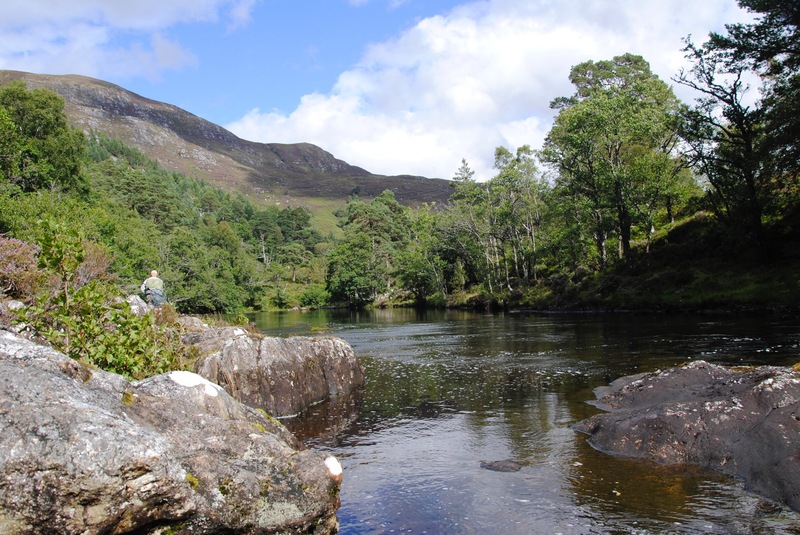 This hidden highland glen that still has a draw that only home has and I think I can in some way relate to the salmon and that draw that pulls them home to the burns and rivers they spent their early life in. StrathFarrar is a magical glen and it will see me far more often that’s a guarantee. And I will be back come next May hopefully to search for the bigger brownies.